I’ve had quite a few searches coming through to this blog from people wanting to know how to create a specific kind of page numbering – the kind when it reads “page 1 of 2”, “page 1 of 5”, “page 2 of 3”, etc. If you want more detail on page numbering, read this article on the basics and this one on the finer points. 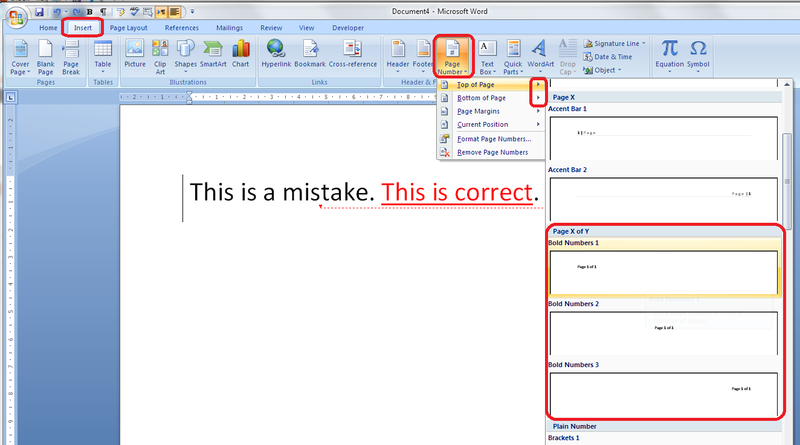 If you want to know how to make “page 1 of 10” appear on your document read on! Why would I want to make my page numbers say page 1 of 2? It’s a matter of personal choice as to how you format your page numbers. However, your department or office might have a style guide that dictates this, so it’s as well to know how to do it. How do I get page numbers to say page 1 of 2? As I mentioned, I have more detailed resources on page numbering. This is more of a ‘quick and dirty’ guide. Note that you can’t change this in Page Number Options, you must do it using the Page Numbers option as shown above. If you have found this article useful, please share it using the buttons below, and leave me a comment! This is part of my series on how to avoid time-consuming “short cuts” and use Word in the right way to maximise your time and improve the look of your documents. How to add page numbers to your document 2 – advanced editing etc. Please note, these hints work with versions of Microsoft Word currently in use – Word 2003, Word 2007 and Word 2010, all for PC. Mac compatible versions of Word should have similar options. Always save a copy of your document before manipulating it. I bear no responsibility for any pickles you might get yourself into! Thanks so much for this. Huge help! Thanks for your comment – I’m glad I could help! How do you do this when formating a three part footer? Thank you for your comment. If you have several elements in a footer, you should be able to use “format page number” in the same way as here. If you’re doing something more complicated with macros etc., I’ll need to know exactly what you’re doing and are trying to achieve, then can try to help. But try “format page number” first and see how that goes. Thank you for your comment. I would imagine that you’ve got section breaks turned on – use the show paragraph markers button to see what breaks you have, remove the section breaks or change the header or footer where you have your page number to “the same as previous” and it should work fine. Bingo… within the first few lines of results I found your page and your clear and helpful solution. Thankyou for a great service! You’re welcome, glad it’s still high in the search results and that you found the article helpful! Hi, I have a header with text and I want page numbering 1 of 7 etc.. When I follow your suggestions which were very helpful thanks it puts the page number in the wrong place, I have selected top right and it is inserting it too low, can you help me please. Have you looked at my posts on page numbers? https://libroediting.com/2013/02/27/how-to-add-page-numbers-to-a-word-document-1/ is the first one. You might find that you’ve already got something in the header which is pushing the number down. It will place it in the bottom area of the header as standard, so you might want to edit your header to get around that. I hope that helps! Thanks Liz, I had looked at your posts on page numbers but thanks for link. I had got a page number set in the margin somehow, that wasn’t actually showing on the screen, a page preview highlighted that. This is an amazing site, I just know I will be retuning thank you once more. Oh, good, glad you got it sorted out. Let me know if there’s anything I don’t cover that you need and I’ll be happy to write about it. Thank you very much this was very very useful! hi, this is great, how can i do this in a MAC computer? Here’s the solution for Macs. Not as easy, but can be done. You need to use Insert/AutoText. I am using page number, page x of y, in a series of technical specifications. Page one footer is different as I have information about the document in a table in the footer on page one and just document number and page x of y on all remaining pages. I use PAGE and NUMPAGES. Everything appears correct when I am in the document. However when I save and reenter the document page one always displays 1 of 2 while the remaining pages are correct 2 of 7, 3 of 7 etc. When i double click on the footer the page count on the first page corrects itself. I read a lot about numbering with sections and wonder this problem is because I use a table at the bottom of the first page for the document information is this forcing a section break on page one? It does not display a section break when i enter alt + F9. Hello Mike, and thank you for your question. I suspect it is the table in your footer that is causing the problem. The only solution I can think of is that you put the page numbers in the header instead. It might be worth trying this anyway, to see whether it works.